"Using a metal tool, Cindy Walton scrapes at the surface of her painting. Flakes of yellow, gray and white are lifted from the plywood surface, revealing lines of burnt orange and other colors. 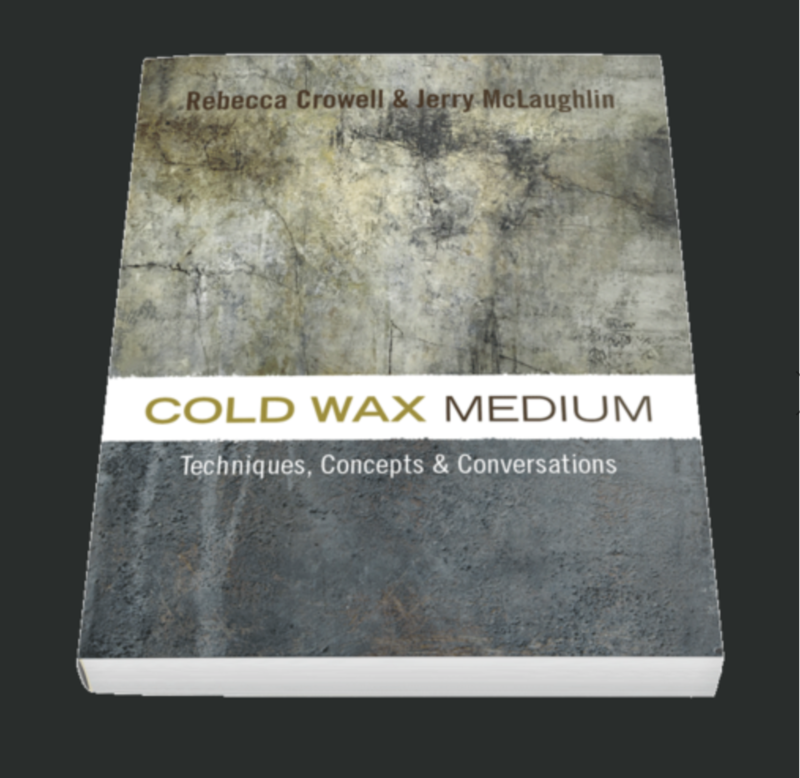 Cindy’s comments and painting “Autumn Fog” are included in the newly published book by Rebecca Crowell and Jerry McLaughlin, “Cold Wax Medium: Techniques, Concepts, Conversations." “Cindy Walton captures action, energy and quiet musings of nature in her paint- ings. 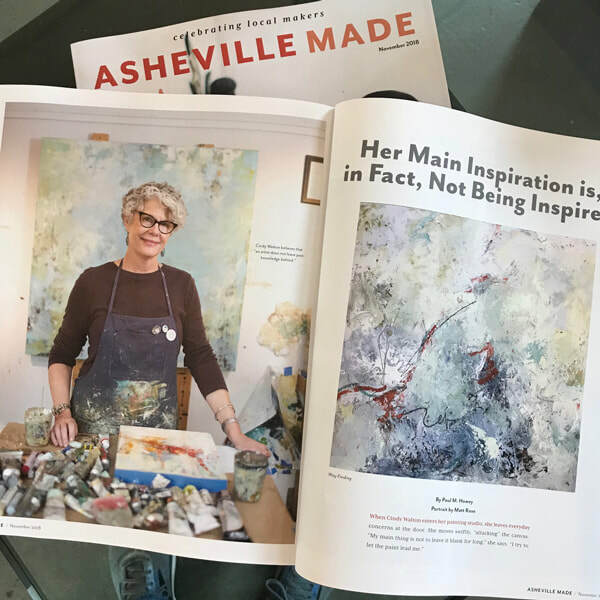 Through writings and bold marks traveling in and out of the layers of oil and cold wax, the Asheville, NC, artist layers surfaces with paint to create depth and texture. " 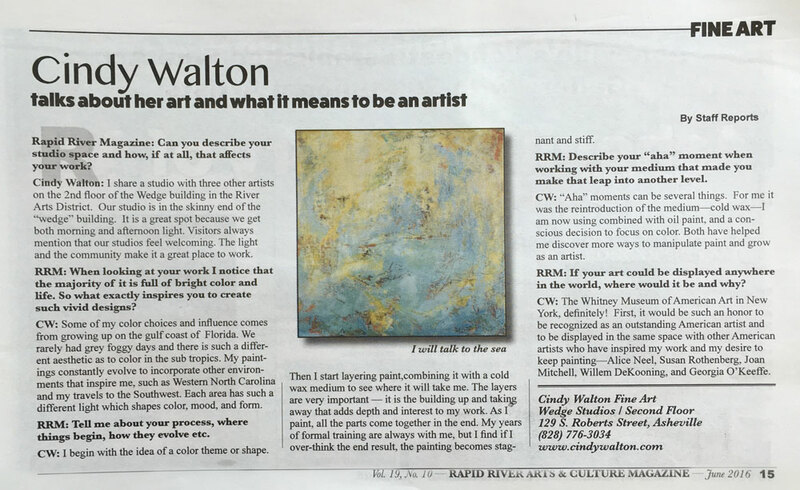 “Working with Cindy Walton has been a joy. She is always eager to give. She is an ‘of course!’ person,” describes OpenDoors Art Chair, Kristan Dewey. 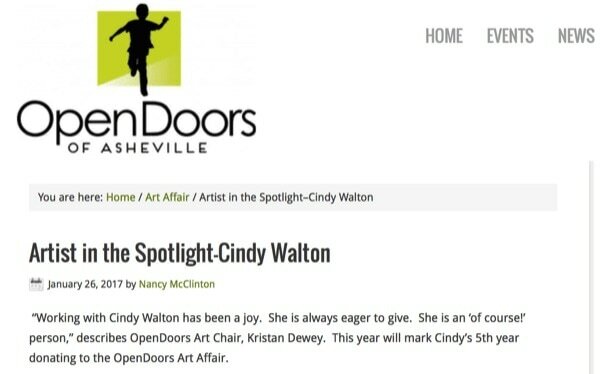 This year will mark Cindy’s 5th year donating to the OpenDoors Art Affair. 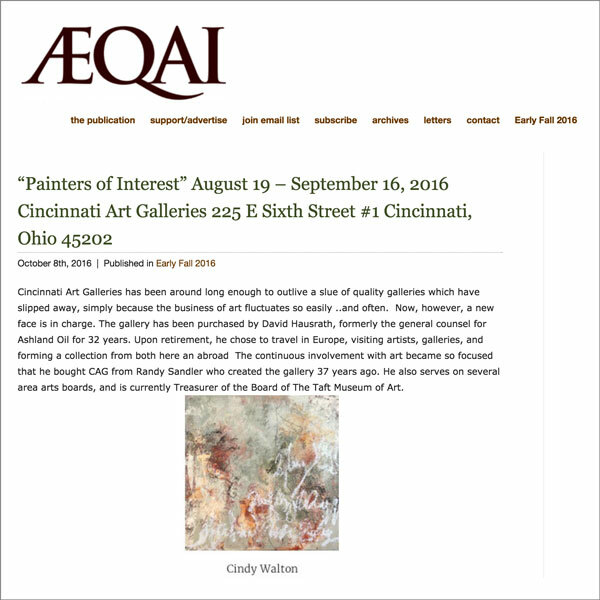 Review of “Painters of Interest” exhibition at the Cincinnati Art Galleries by Fran Watson for Aeqai, a Cincinnati-based e-journal. "there are several paintings in oil and cold wax by Cindy Walton, four of which have been sold already, and all of which are layered with hypnotic strokes, scrapes and graffiti in lemony-gray shades broken with just the right subtlety of varying color in the same tonal range"
Click here to read the article featuring Cindy and other artists in the show. 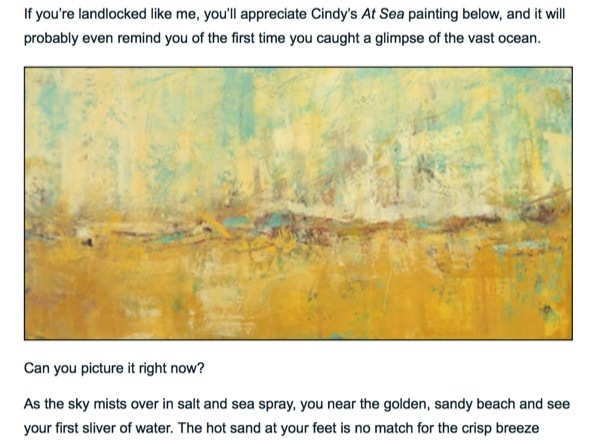 "Cindy Walton, an artist from St. Petersburg, Florida, opened a workspace in the Wedge Studios building four years ago. 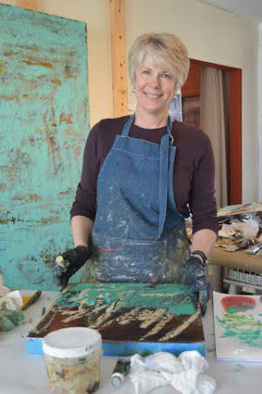 She uses cold wax and oils on wood panels to create abstracts influenced by the emotional feel and colors found in natural landscapes. 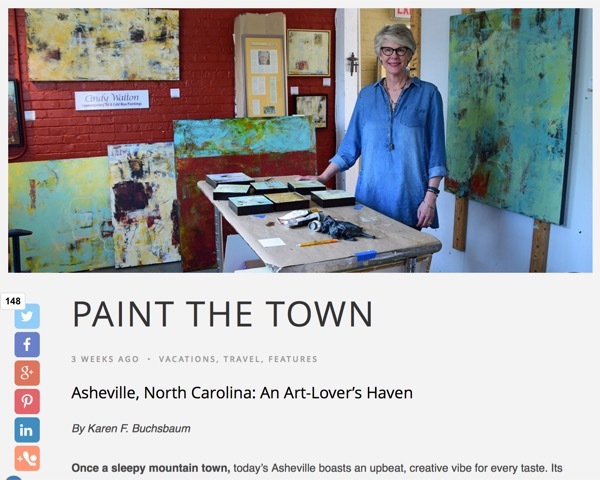 The Gulf Coast beaches of Walton’s youth and the mountains she loves have significantly influenced the vibrant colors, metallics and textures in her unique paintings." 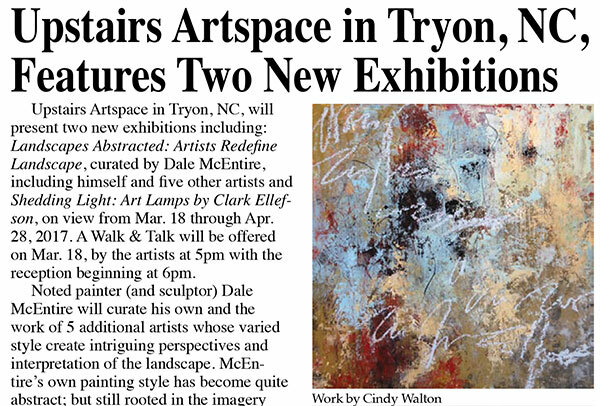 Click here to read the rest of the article featuring Cindy and other artists in the River Arts District. 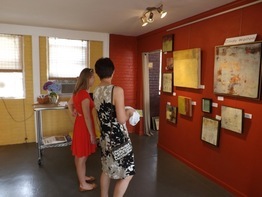 ​Many thanks to Cassie Rief for a wonderful article and to Dan Duhrkoop for creating Empty Easel. "In Flight", the "Signature Painting"
Cindy Walton, artist/teacher with local non-profit Aurora Studio & Gallery - A Studio Where Artists Heal, Grow & Thrive! Cindy Walton finalist for Pecha Kucha presentation at Green Hill Center for the North Carolina Arts.